The cold winter has finally arrived in Adelaide! This wet, humid and freezing cold weather made me lazy. There has not been many choices regarding fruits in markets. Mandarins, oranges, apples and pears are the most ones observed. Although some of these are high in antioxidants naturally, I recently discovered some products that contains extremely high amount of antioxidants and are very tasty too. Remember several month back, I bought the AntiOx Juices which I added soda water to dilute? 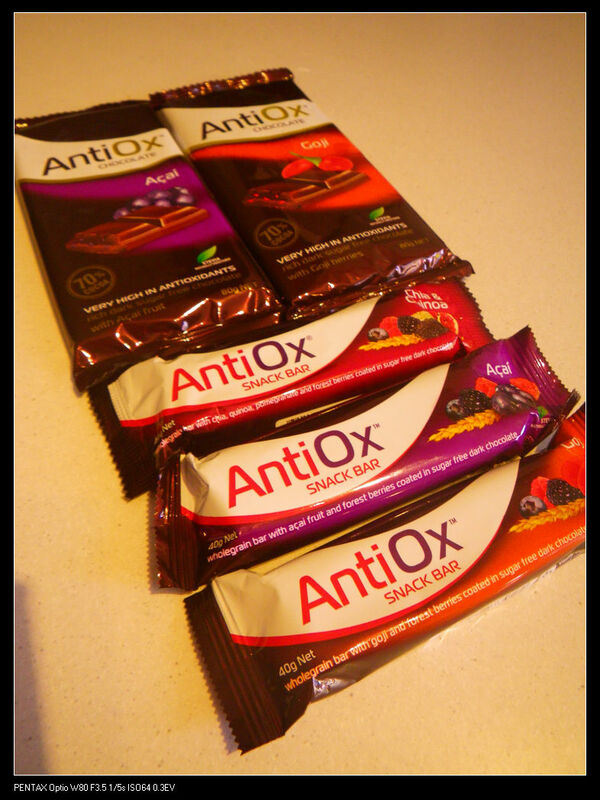 The new products that I discovered are from the same company – AntiOx Chocolates! There were five different products in the series, containing 3 types of snack bars and two types of chocolate blocks. The 3 types of snack bars are 40g each with different flavours. The 3 types of the snack bars are Acai, Goji and Chia & Quinoa with forest berries and are coated with sugar free dark chocolates. 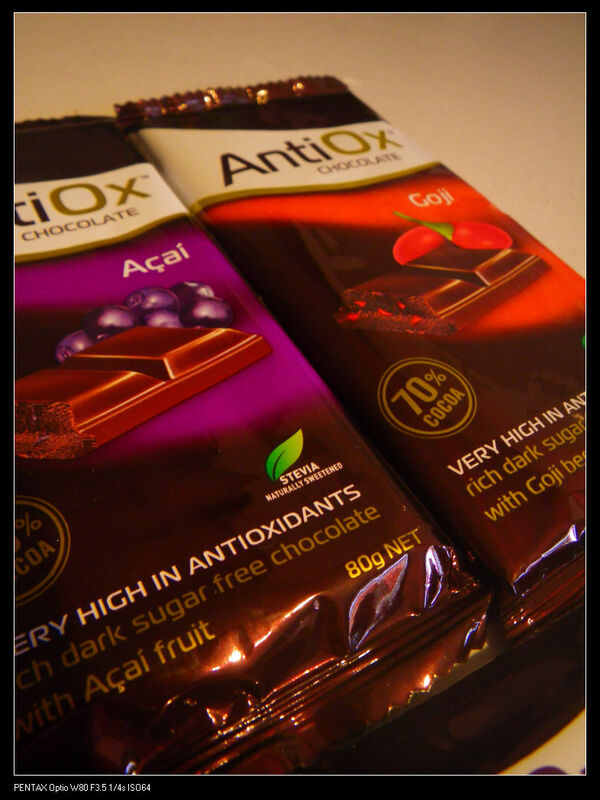 From the content list, we can obviously seen that the bars are very high in antioxidants. These compounds are active in removal of free radicals in human bodies and they mostly exist in berries. The Acai and Goji are traditionally known from ancient medicinal books that have proven track records to improve human immunity. Free radicals can count for our ageing, unhealthiness and lack of energy because of their targeting effect in human body. Removal of these free radicals can certainly improve our health. However, please note that some research papers claimed that man-made or in another word, syntesised antioxidants and vitamins may be potential cancer causing agent and hence there is no need to take antioxidant supplements. The best channel for obtaining these compounds is consumption of fruits directly. Anyway, back to the taste of these snack bars. They are, in fact, delicious! 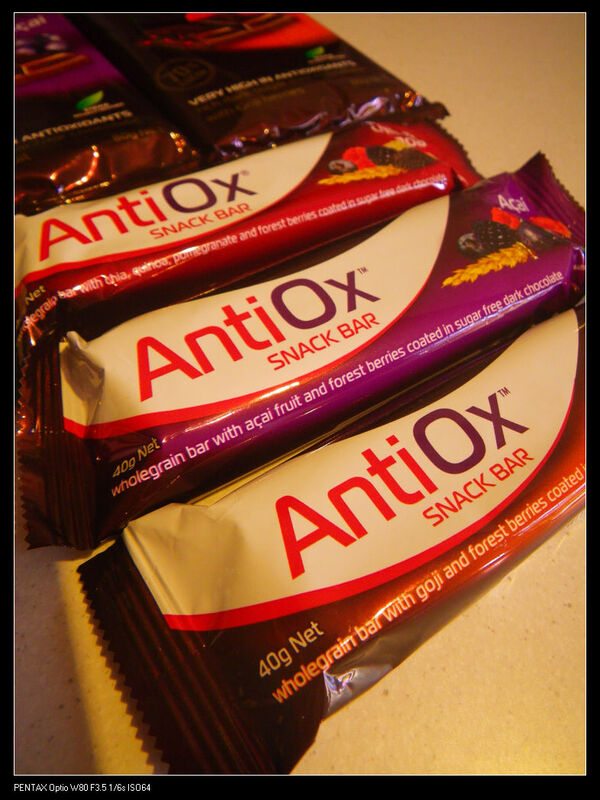 You may have noticed that for the AntiOx juices, I thought they were too concentrated but the bars are quite balanced. Slightly sweet berries with a hint of sourness was the main characters of these bars. Although the Acai and Goji berries had some bitter taste, the dark chocolates covered all. If you like dark chocolates as I do, then I am sure you will fall in love with these bars. Indeed, the bars are very chewy but not sticky on teeth. The health benefits were even better as only real fruits were used in the bars, it would be a much efficient way to increase daily antioxidant intake. The bars are reasonably priced at $2.49 and are available from most health stores and supermarkets. The chocolate blocks comes with the Acai and Goji berries with dark chocolate which had 70% cocoa. According to the package, the blocks contained very high amounts of antioxidants and one block of the product is equal to 80 cups of green tea in terms of the antioxidant content. I found the taste of these blocks were not as rich and as intense as the snack bars in terms of the sourness and sweetness. However, the distinctive flavour of the Acai and Goji berries were so rich and noticeable! The blocks are selling at $4.65 at health stores and most supermarkets. Now, it comes to the giveaway! 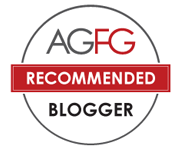 I have 3 prize packs to giveaway, each containing the followings – all 5 AntiOx products. 3. The first 2 tasks are mandatory and must be completed to enter the competition. Subsequent tasks are optional, but will gain you more entries, thus more opportunity to be a winner. 5. 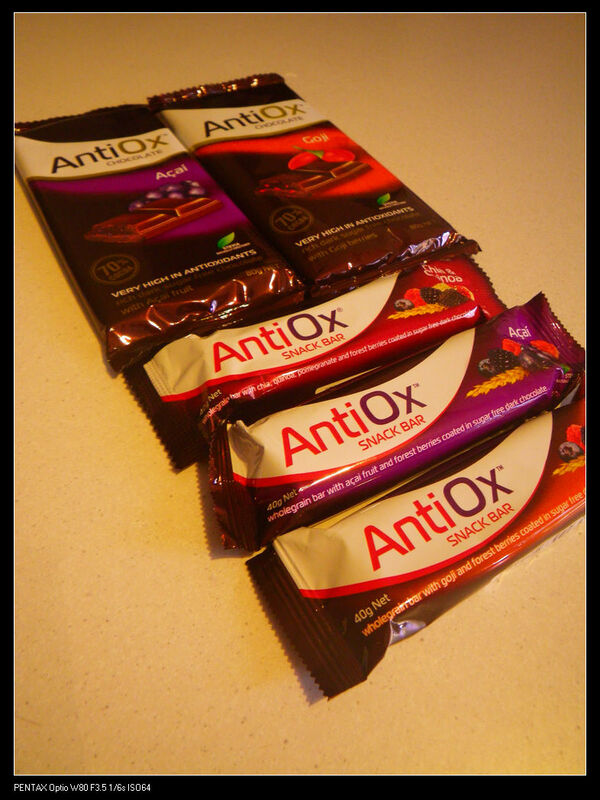 I have 3 AntiOX Chocolate prize packs to give away, each containing all 5 AntiOx products. Click through the following image to the giveaway! Good luck!